It’s been about 18 months since we moved into our house, but only recently have we begun to landscape beyond the basic builder’s package. A designer helped us formulate a plan that we intend to roll out in stages over the next several years. This spring, we initiated phase one: creating more strategically placed planting beds. That meant removing sod—a LOT of sod. 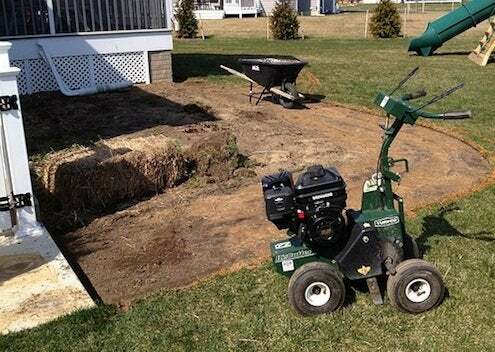 Sod is expensive to install and, surprisingly, expensive to remove. Even if you rent a sod cutting machine, the work is still labor-intensive and time-consuming. Not to mention that once you have the sod lifted, it must be hauled away and dumped somewhere—at a price, of course. Our landscape designer suggested that we see if anyone nearby might want to re-use our sod. So I put the word out on our neighborhood Facebook page. Within 30 minutes, I had a taker: neighbors Pam and Ray, who had less than satisfactory success seeding their lawn upon moving into a home just blocks away. I was beyond delighted. For one, the time and money we saved in not having to haul and dump the sod could instead go to cutting more planting beds. More than that, I absolutely hate to waste anything and was thrilled that someone could use the perfectly good grass. Pam and Ray were ecstatic, too, when they saw an enormous pile of sod rolled up at the edge of our yard. 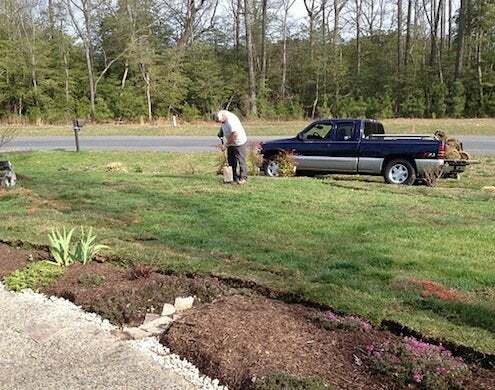 It took several trips in Ray’s pickup truck, but our “old” sod is now enjoying a “new” home.